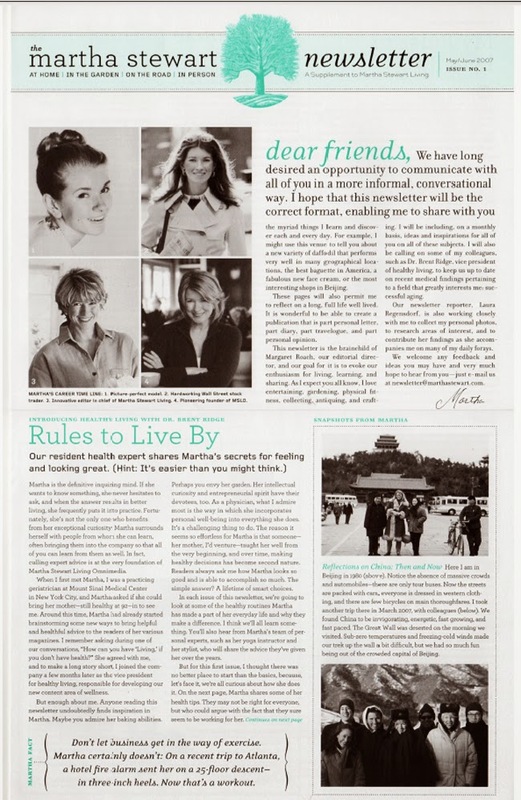 In early 2007 I received a special invitation, which arrived with my issue of Martha Stewart Living magazine, asking if I would like to subscribe to a new publication the editors were working on called The Martha Stewart Newsletter. Intrigued, I hastily sent in my order with payment of $22 and eagerly awaited the arrival of the premiere issue. It came in late April in a plain white envelope with telltale turquoise trim. I carefully opened the envelope and excitedly read the first issue of the newsletter (May/June 2007) on my balcony. The project emerged as a way for Martha Stewart to interact more personally with her fans by sharing information about her life, her travels, her favourite things and some of her household tips. It was the brainchild of the editor-in-chief of Martha Stewart Living at the time, Margaret Roach, who also edited the newsletter. Martha's introduction sums up the aim of the newsletter nicely: "It is wonderful to be able to create a publication that is part personal letter, part diary, part travelogue and part personal opinion." 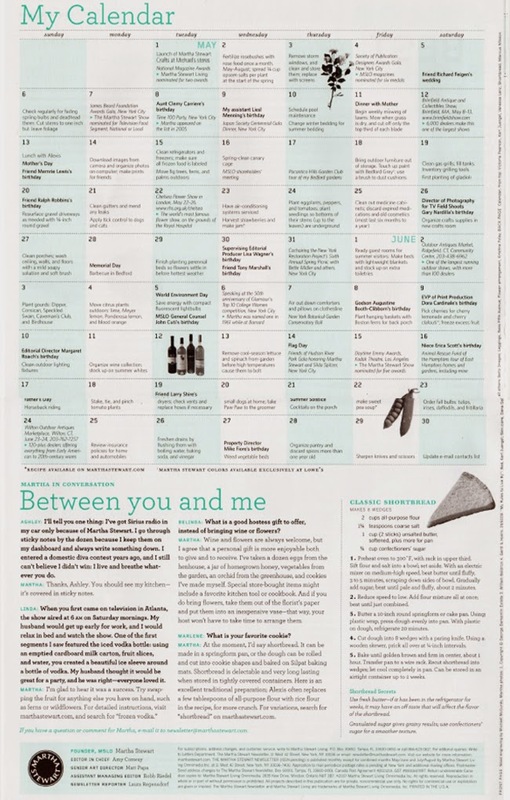 The newsletter (four large pages printed in broadsheet format on heavy card stock) was a way of reintroducing many of the components that readers of Martha Stewart Living had grown to miss. Shortly after Martha's criminal indictment, many of the features that Martha contributed to the magazine disappeared: Martha's Calendar, for instance, the Letter From Martha at the beginning of each issue of Living and her Remembering column. Elements from all three columns were combined and expanded upon in new columns in the newsletter that focused on Martha's new trajectory and interests. There was a large focus on health and wellness, travel and personal remembrances. Martha's favourite poem, The Lanyard by Billy Collins was included in the first issue, as were her picks for the best croissants in New York City and photographs from her modeling days. In the premiere issue, you can find her favourite shortbread recipe, personal gardening tips and photographs from her travels, past and present. Only three issues of the newsletter ever published, however, replaced in late 2007 by TheMarthaBlog.com. It made sense, of course, to cut down printing costs and provide readers with much more immediate access to an online repository of information and photographs of Martha's homes and travels. The blog could be updated daily, whereas a bi-monthly newsletter would only provide occasional (albeit in-depth) correspondence. Copies of the newsletter are quite hard to come by today, so if you have a copy, hold on to it. Its limited printing means that it could become quite collectible. Yes the daily blog seems much more logical, and really pleased, now we seem to back to daily updats ( after the tragic loss of Ms Stewart's sister who wrote the blog) . Just fairly sure none of the comments are looked at , as few are commented on and seemingly no requests for future constant are addressed........there just seems to be a disconnect . PS yes I agree probably on eBay the news letters would sell quickly .......at least I am positive you can recoup you $22 for 4issues! APM they partially refunded me for the subscription. I only have two issues. The third (and final) one never made it to me, sadly. If possible I would be interested if my pessimism as to the future of the brand is shared by you. I really would be pleased to have you point out where I am incorrect as I would like MSOL to be there for the future to share its style. APM, while I think the brand has gone through many changes over the last decade - and has suffered many financial losses - I think the company's profile is stronger than it has been in a very long time. Keep in mind the entire magazine publishing industry is in decline right now, so it's not just Martha's magazine that is suffering from a loss of ad sales. (Fewer ads mean less content.) Also, the company is becoming more of a merchandising brand (sheets, towels, kitchenware) than a media company these days. I think the company's glory days are behind it, but I also think that it's never too late to recapture (and reinvent!) some of that magic. At this point, I'm just going with the flow and enjoying the ride. I will have to remember that while things change it is not always for the worse..... just different. As Martha likes to say: "When you're through changing, you're through!" Do you think the use of the phrase " ..hope this is the correct format.." was foreshadowing the intent never to fully engage with the concept? From tote bags to flimsy metal recipe boxes, MSLO tried so many attempts to lure subscribers and the die hard fans were led astray in the wake of corporate decisions rendered by a revolving door of "editors." I had forgotten about this newsletter and this post reminded me that I have these! I will have to go in my files and see how many I received.